Original vintage sewing pattern from 1957. Girls pullover top accented with neckband, sleevebands and tab detail in same or contrasting fabric. 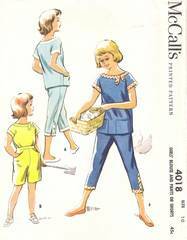 Shorts and pedal pusher length pants have front yoke pockets, side zipper and waistband. Leg band and button trim on the pants leg edge coordinate with the top. Girls Size 10, Breast 28; Waist 24; Hip 30.